We cover all of Bristol, South Gloucestershire and the surrounding areas offering professional leather cleaning services. If you would like to find out more or get a free, no obligation quotation with no hidden costs call Karen today on 01454 436001 / 07774 908410 or get in touch using the form on our contact us page! We use the very best leather cleaning and conditioning products to clean and care for your leather furniture which means your leather furniture will be not only thoroughly clean but also supple and conditioned. 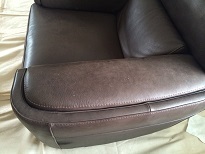 Our thorough process ensures superb cleaning results and our protection and conditioning treatments help prolong the life of your leather furniture. 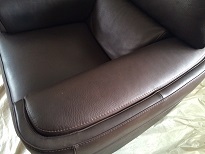 We are fully trained and insured in all aspects of leather cleaning. And of course all our leather cleaning services are covered by our full satisfaction guarantee. We are passionate about customer service, for your complete peace of mind and to find out more see our service promise. We guarantee you great local service with integrity at a fair price! To find our more about our thorough, professional leather cleaning services across Bristol, Bath, South Gloucestershire and the surrounding areas, or to arrange a free, no obligation quotation with no hidden costs call Karen today on 01454 436001 / 07774 908410 or get in touch using the form on our contact us page! We provide professional, fully insured leather cleaning services across all of Bristol, Bath and South Gloucestershire. We cover all areas of Bristol, Bath and South Gloucestershire including Almondsbury, Bradley Stoke, Thornbury, Chipping Sodbury, Yate, Portishead, Clevedon, Winterbourne, Stoke Gifford and all surrounding areas and villages. We also cover further afield including all areas of Gloucestershire, Bath, Wiltshire and North Somerset. So if you are looking for leather cleaning Bristol, Bath, South Gloucestershire and all surrounding areas we would be delighted to hear from you!